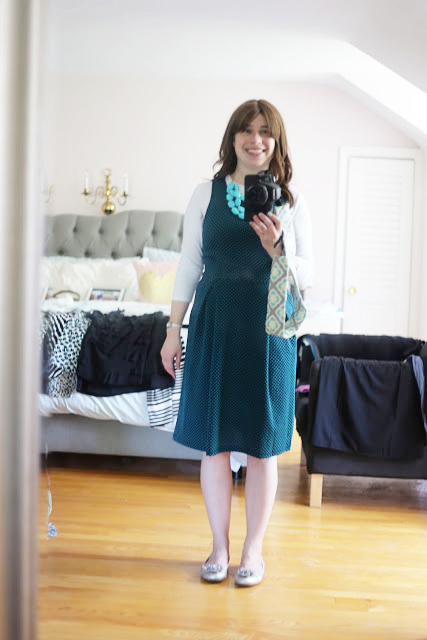 About a year ago, I decided to try Stitch Fix for the first time. 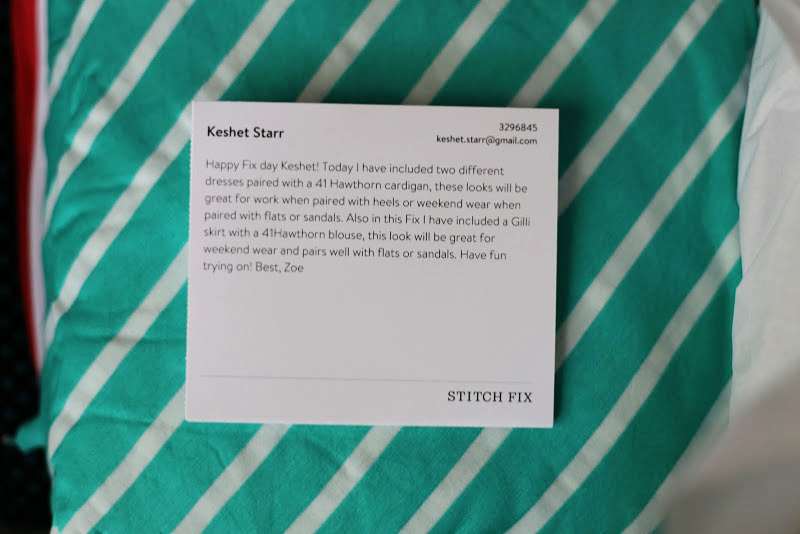 If you're new to the concept, Stitch Fix is a service that mails you several clothing items that you get to try on in your own home and decide what to keep and what to send back. 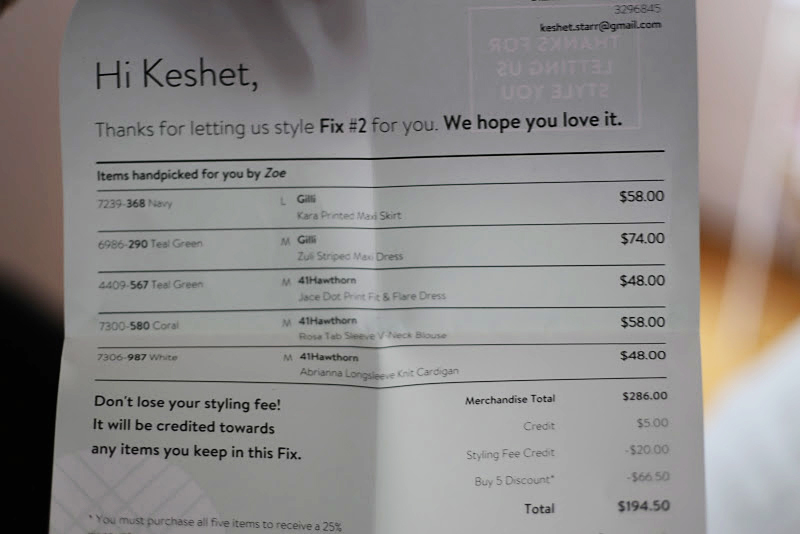 There is a $20 styling fee which goes towards any purchase you make, but if you decide not to keep anything, you are out that $20. 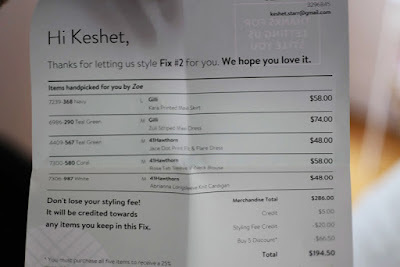 Full disclosure: If you decide to try Stitch Fix using my referral link, and schedule a Fix, I will receive a $25 credit. 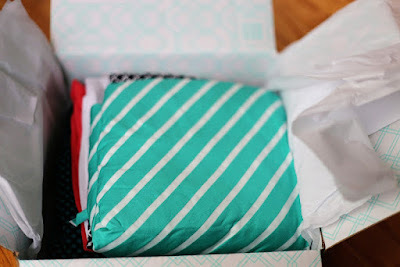 That being said, this is going to be a very honest review of my experience with Stitch Fix, and its pros and cons. 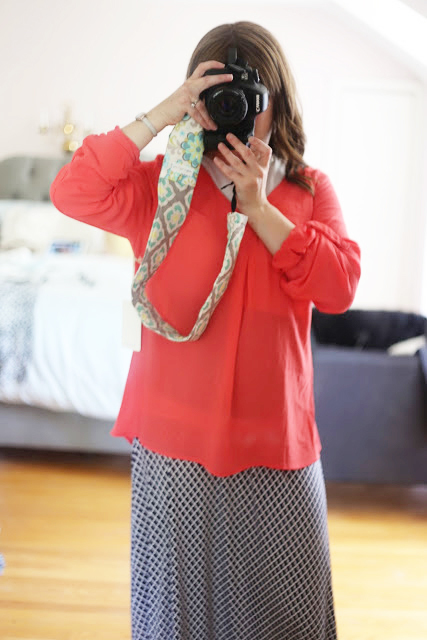 When I first tried Stitch Fix, I kept one item--you can see the full post and review HERE. Although I liked the shirt that I kept, I did think that the prices on the items were overall higher than what I would normally spend, so I waited a while before trying the service again. 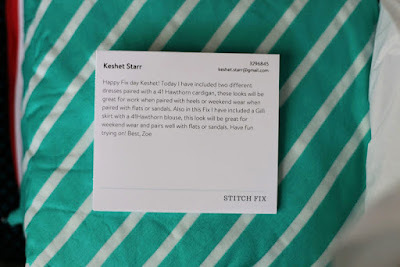 After seeing a ton of fun Stitch Fix reviews on blogs, I decided to give it another whirl. For me, the funnest part of the service is the element of surprise: opening the box and seeing the pretty colors and patterns inside! As well as a details on the price of each piece. 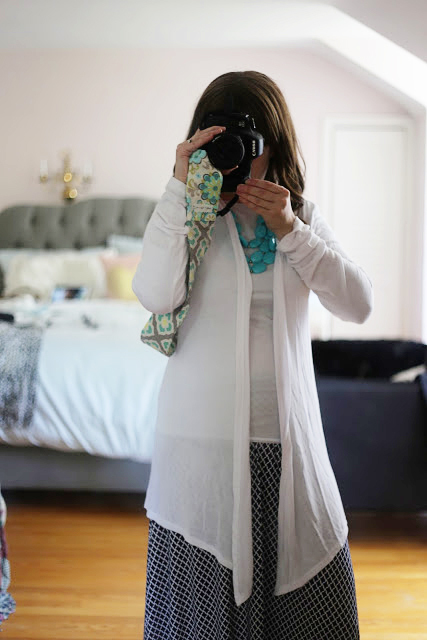 Note: One great aspect of Stitch Fix is that if you keep all five items, you get an extra 25% off! This cardigan was definitely pretty and very summery (not to mention super comfortable) but I get hot easily (I blame the babies--they raised my body temperature!) and don't wear cardigans very often. Also, I thought the price was high for a basic item that would probably spend most of its life stuffed into a purse. If I were a cardigan person, though....then I would be in trouble. Verdict on this one = Sent back! 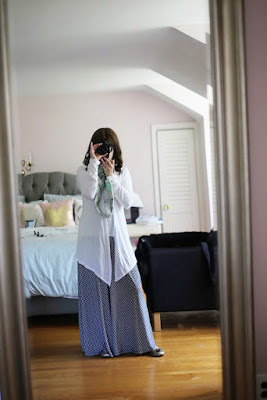 My next two items were the 41 Hawthorn Rosa Tab Sleeve V-Neck Blouse ($48) and the Gilli Kara Printed Maxi Skirt ($58). Now the style card suggested I wear these items together....but I wound up looking larger than I did when nine months pregnant! The top was a gorgeous color but way too large (see the shot below!). Something was also up with the sleeves--they were SUPER tight and I could barely get them on. 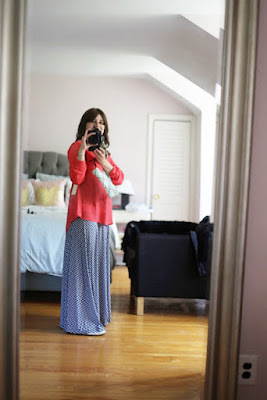 AND it was sheer all over, which is a big downside for me since a modest wearing of this top would equal MANY layers. 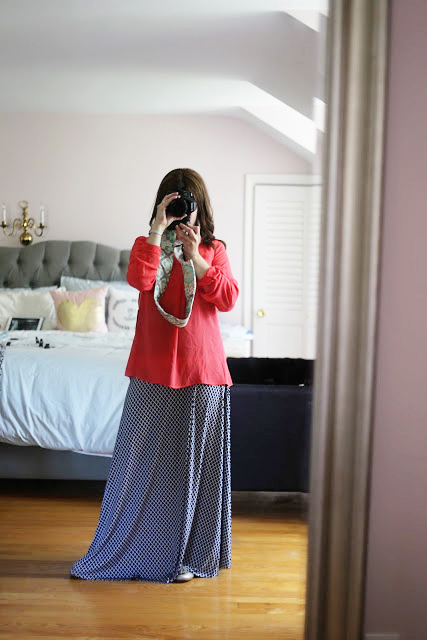 As for the skirt, (a) it was way too long, and (b) the pattern was ok, but nothing too exciting. And I can't imagine ever paying almost $60 for something that I could basically get at Target. Verdict on both = Sent back! Now, this is one where I'm getting a little bit of Stitch Fix regret looking at the photos! My main issues with this were fit: it felt a little tight and a little short, and for the price, I wanted it to fit perfectly. I also didn't love how the dress looked with a shirt underneath--I think it might look better with a black shell, but it's June and I ain't wearing black on black anytime soon. 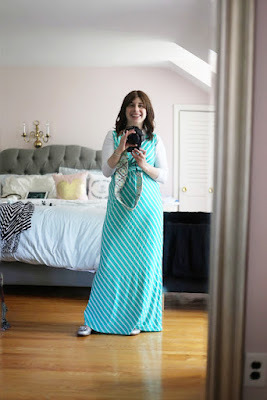 Before I discuss this dress, I have a confession to make: I have never, ever worn a maxi dress. As a shorty, it can be hard to find ones that aren't too long, and I've always thought the style overwhelmed me a little bit. While I would have LOVED this mint striped pattern on a top or skirt, it was just too much for me in a long dress. BUT it did inspire me to give the maxi dress look a try--I'm searching for a black one that may be more subtle and easier to wear. 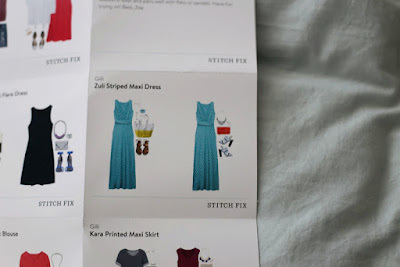 Another side note: Every Stitch Fix item comes with a style card giving you inspiration on how to wear the item! Now, at first glance, this Fix was a total bust--5 items sent, 0 kept. After this, I'm really on the fence about trying again. Here are some of the pros and cons of the service for me. Last but not least--the fun of getting that box! Major con for me = the prices are MUCH higher than what I would normally spend. Which is a big issue if the item is a fashion risk! What do YOU think--would you try Stitch Fix again? If I were sending back five out of five items, then I would think long and hard before trying Stitch Fix a third time. I wouldn't mind trying the service if plus sizes were offered, though -- I agree that it could be a good thing to get out of a style rut. I think you should've kept the dress. It looks amazing on you! They likewise give city-wise data about packers movers. Individuals might pick one of them as indicated by their simple advantageous. Will follow up your blog. 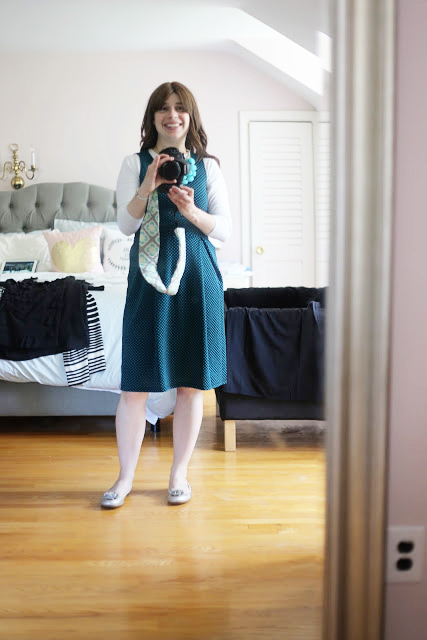 A guest post and some fun links!